How Do Storms Affect Asthma? There are observations in various geographical areas that thunderstorms occurring during pollen seasons can induce severe asthma attacks in pollinosis patients. An accredited hypothesis explaining the association between thunderstorms and asthma suggests that storms can concentrate pollen grains at ground level, which may then release allergenic particles of respirable size in the atmosphere after their imbibition of water and rupture by osmotic shock. During the first 20–30 min of a thunderstorm, patients affected by pollen allergy may inhale a high quantity of the allergenic material that is dispersed into the atmosphere as a bioaerosol of allergenic particles, which can induce asthmatic reactions, often severe. Subjects without asthma symptoms, but affected by seasonal rhinitis can also experience an asthma attack. A key message is that all subjects affected by pollen allergy should be alerted to the danger of being outdoors during a thunderstorm in the pollen season, as such events may be an important cause of severe asthma exacerbations. In light of these observations, it is useful to predict thunderstorms and thus minimize thunderstorm-related events. Patients with respiratory allergy induced by pollens and molds need to be informed about a correct therapeutic approach of bronchial asthma by inhalation, including the use of bronchodilators and inhaled corticosteroids. The purpose of this review is to focalize epidemiological, etiopathogenetic, and clinical aspects of thunderstorm-related asthma. 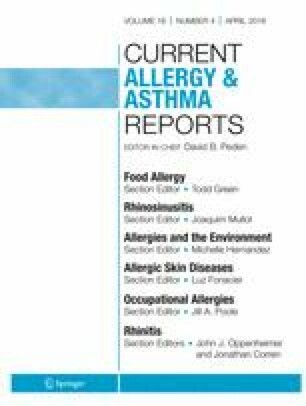 D’Amato M, Cecchi L, Annesi-Maesano I, D’Amato G. News on climate change, air pollution and allergic trigger factors of asthma. J Investig Allergol Clin Immunol. 2018;17 https://doi.org/10.18176/jiaci.0228.